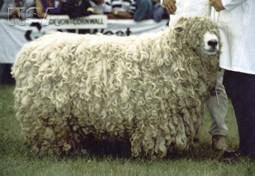 Devon Longwooled Sheep have a well-covered Head with long curly wool. Both sexes are polled. The body is covered in long curly, white wool. Well-proportioned with a strong wide and long top, with well sprung rib giving plenty of volume. The rear being well muscled with good conformation. Average mature ewe weighs 100kg, rams 136kg.